The trilobite beetle (Duliticola hoiseni) is an endangered species in its native countries. For this reason, you can't keep them as pets. They are fascinating and unusual creatures, but there are other just-as-interesting non-endangered invertebrates you can keep as pets instead. In Singapore, duliticola beetles are listed as an indigenous endangered species. Because they're considered endangered they can't be imported, purchased or traded, except by authorized individuals, under the U.S. Endangered Species Act of 1973. Researchers like Alvin Wong who have studied trilobite beetles believe they're endangered because they live only in pristine forested areas and possibly because beetle enthusiasts take them out of their natural environment. Because they are a rare insect, few studies have been conducted detailing their life cycles, eating and breeding habits. Trilobite beetles are found in Malaysia, Borneo, Laos and, more rarely, in Singapore. They live in pristine rain forests on the forest floor among leaf debris and decomposing wood. They feed on fresh decomposing wood, fungi and algae slime. A.F.S.L. Lok and H.H. Tan of the National University of Singapore published research in 2008 that said the trilobite beetle had been found in a new part of Singapore, indicating these beetles may be less picky about where they live than previously thought. If more beetles are found in different areas of Asia it's possible they could be moved off the endangered species list, but for now they are a protected species. The beetle genus duliticola belongs to the family lycidae, informally known as "net wing beetles." Many species of net wing beetles are common and easy to raise as pets, including the firefly. Net wing beetle larvae look very similar to the adult female trilobite beetle, but much smaller. Female trilobite beetles are neotonous, which means they still look like larvae even though they're mature. Though trilobite beetles are a protected endangered species, many other species of exotic beetles are interesting, beautiful and perfectly legal to keep as pets. 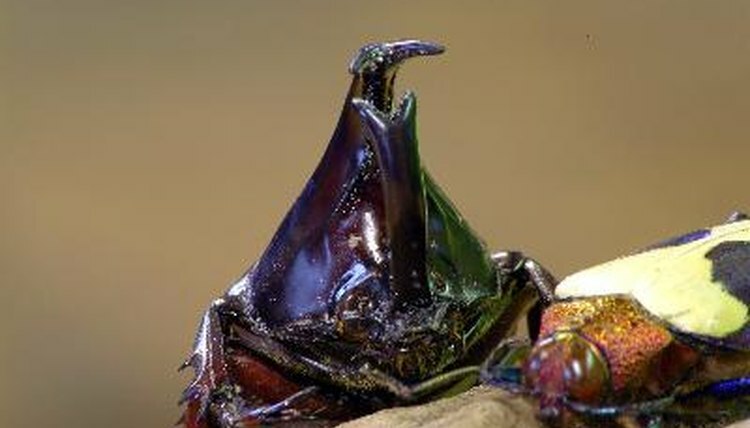 Rhino, stag, giant tiger and Hercules beetles are noted for their exceptional size and unusual body shapes. Jewel beetles and harlequin beetles are beautifully colored living gems traded by specialty pet breeders. If you're not dead set on owning a beetle, many other exceptional-looking invertebrates make good pets. The hissing cockroach grows to 2 to 3 inches long, is hardy and can be fun to handle. Scorpions and tarantulas are available at most pet stores. Millipedes and centipedes come in a variety of colors and can reach 6 to 8 inches long. Isopods, like pill bugs, are available at specialty pet stores. They're probably the most prehistoric-looking invertebrate pet available. Some species can grow to over an inch long. What Countries Do Giant Centipedes Live In? What Kind of Food Do Grasshoppers Eat?